Happy Valentine’s Day! 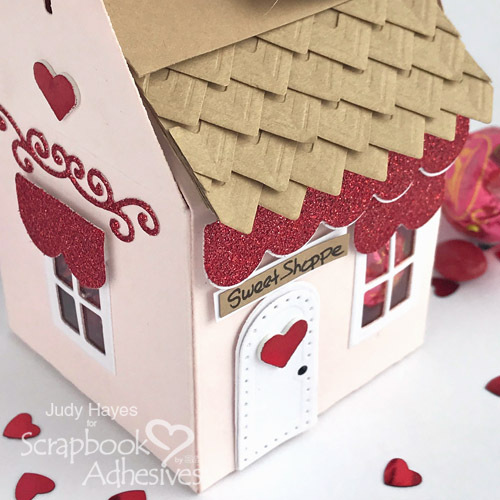 I’m excited to share Sweet Shoppe Valentines Treat Box with you today! I think it turned out so cute! I used a holiday die set but embellished it for Valentine’s Day. 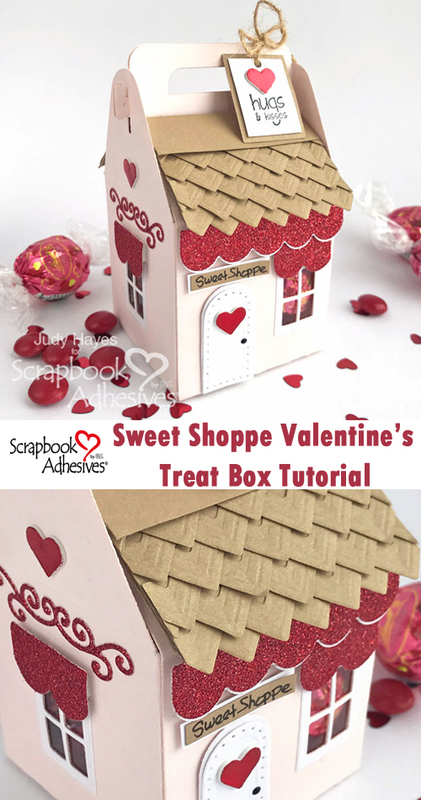 To make this treat box, cut 2 cottage treat box pieces from pink cardstock. (Check the Materials List below for products I used.) Position inner window dies on treat box and die cut. I cut a window centered on each side and on the back and offset the one on the front to allow room for the door. 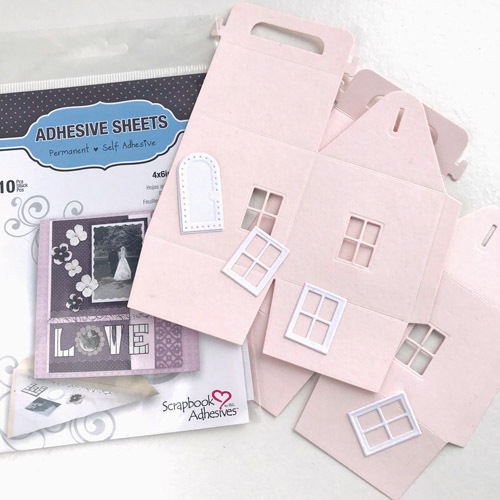 Apply Adhesive Sheets 4 x 6 inch to back of white cardstock. Cut door and 3 window frames from it. Remove adhesive liner and fasten window and door to treat box. Cut acetate slightly larger than windows. 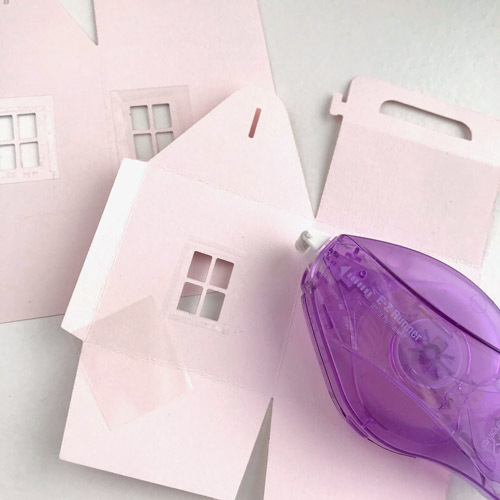 Fasten to inside over windows using E-Z Runner® Micro Refillable Dispenser. 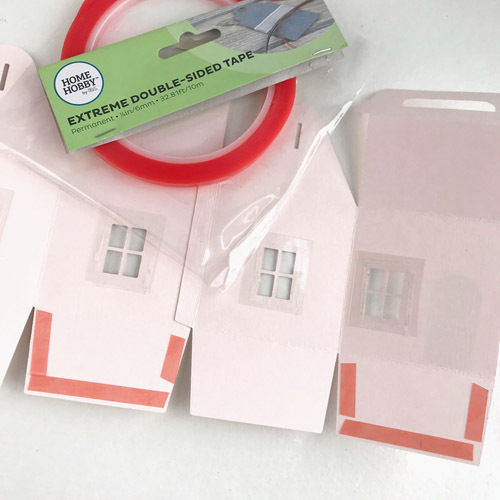 Apply Extreme Double-Sided Tape ¼ inch to tabs. Remove liner and fasten sides of treat box together. 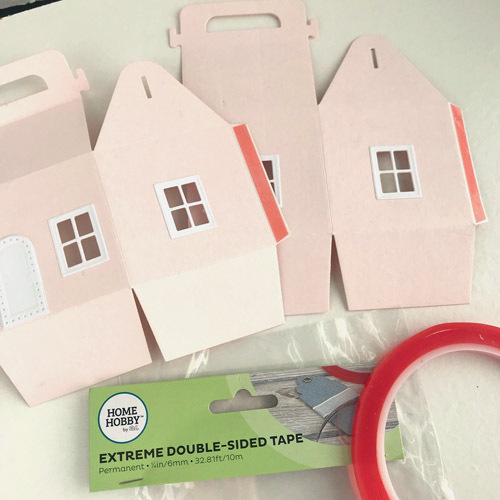 Apply Extreme Double-Sided Tape ¼ inch to two opposite bottom flaps. Fold in flaps without adhesive first. 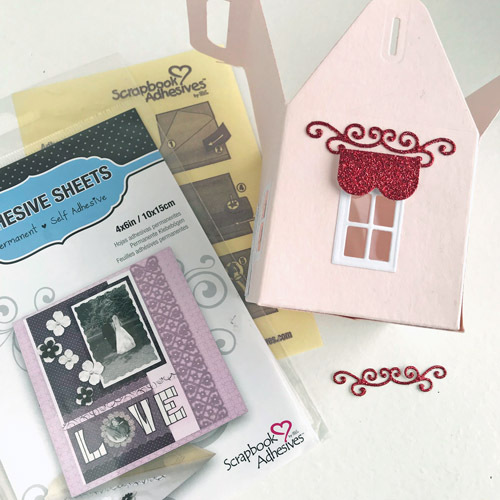 Fold flaps with adhesive and secure by pressing from the bottom and inside the box. I set the treat box on my work surface after flaps were aligned and pressed from inside. Cut 3 scallop pieces from red glitter cardstock and 1 from white cardstock. Cut 2 scallop strips into sections of two to make 4 sections of two scallops. 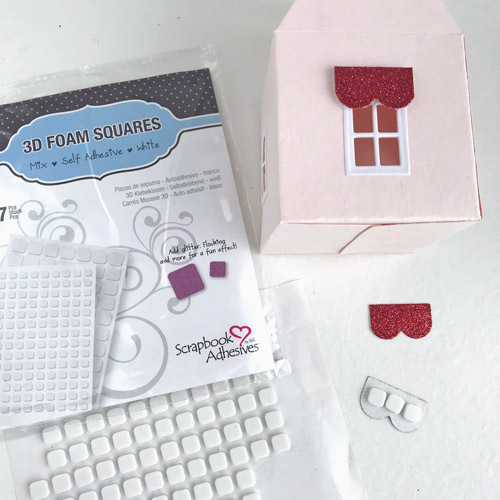 Use small squares from 3D Foam Squares White Mix to fasten a scallop section over each side and back window. For front window, use Thin 3D Foam Squares White Mix small squares to fasten it. (This is so it will fit under the awning). Fasten white scallop piece behind glitter scallop with narrow reveal using E-Z Runner® Ultra Refillable Dispenser. Fasten it across the front with small squares from 3D Foam Squares White Mix. 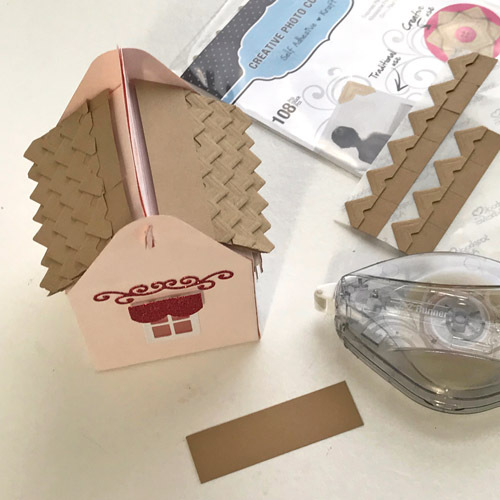 Cut 2 pieces of 1¼ x 2½ʺ Kraft cardstock to fit the roof of treat box. Fasten Creative Photo Corners Kraft by starting with 3 centered across the bottom edge. Fasten 4 over them with points even with first three. Allow photo corners to extend beyond side edges and trim when finished. Apply next row offset and above the first three. Cut photo corner in half to fill in at edges. Continue to add photo corners so there are 6 rows counting first two layers as row one. Repeat for second roof section. 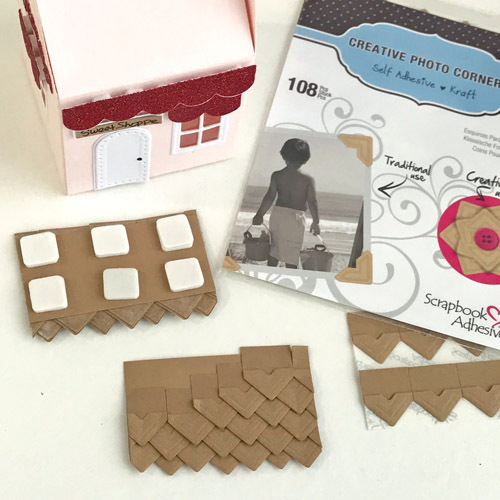 Use large squares from 3D Foam Squares White Mix to fasten photo corner roof to treat box. Cut 2 strips of Kraft cardstock to fit over photo corners at the rooftop (about ¾ x 2½ʺ). Use E-Z Runner® Ultra Refillable Dispenser to apply adhesive and fasten it over photo corners at top of treat box roof. 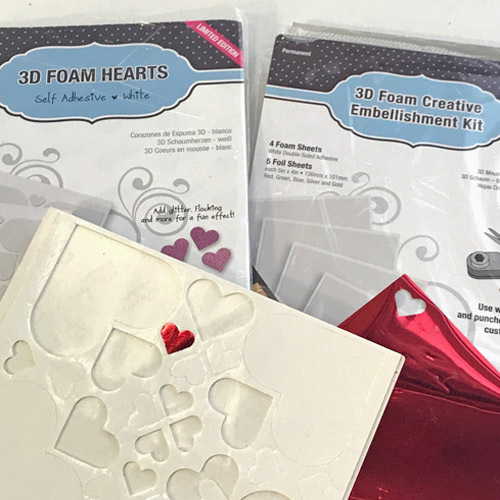 Remove liner from one small 3D Foam Hearts. 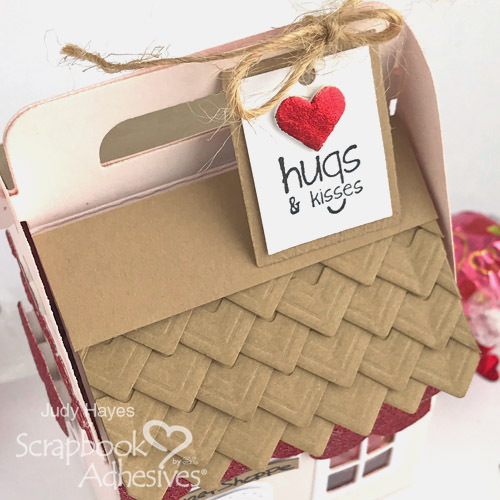 Place red foil from 3D Foam Creative Embellishment Kit over the heart and rub to transfer to heart. Remove foil. Repeat for 4 small hearts. Handwrite “Sweet Shoppe” on a tiny piece of Kraft cardstock with black fine point marker. Use E-Z Runner® Micro Refillable Dispenser to apply adhesive to back. Fasten to a white mat. Cut small squares of Thin 3D Foam Squares White Mix in half. Use to fasten sign above the door on treat box. Add a dot of black Enamel Accents for the doorknob. For the tag, cut white cardstock ⅞ x 1⅛ʺ and Kraft cardstock 1 x 1¼ʺ. Stamp verse with black ink on white piece. Fasten to Kraft piece using E-Z Runner® Micro Refillable Dispenser. Fasten heart to tag. Punch hole at the top. 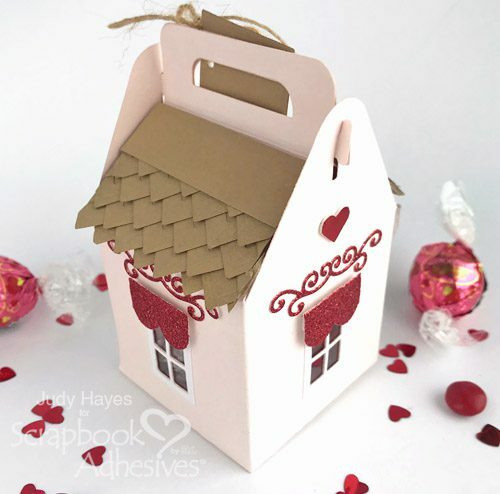 Tie to Sweet Shoppe Valentine’s Treat Box with twine. I tied it to front handle only so the box can be opened without removing the tag. Even the back side is cute with the treats show through the windows! This entry was posted in 3D Foam Creative Sheets, 3D Foam Shapes, 3D Foam Squares, 3D Projects, Adhesive Sheets, Adhesives, Crafts & Tutorials, Creative Photo Corners, E-Z Runner® Dispensers, Extreme Double-Sided Tapes, Gifts, HomeHobby by 3L, Intermediate, Metallic Transfer Foil, Party Favors, Permanent Adhesive, Seasonal Craft Ideas, Skill Level, Tutorial, Wear your Adhesive on the Outside, Winter and tagged 3D Foam Creative Embellishment Kit with Foil, 3D Foam Hearts, 3D Foam Squares Mix White, Adhesive Sheets 4x6", Bazzill, Best Creations, Creative Photo Corners Kraft, Creative Photo Corners Mix Pack, E-Z Runner Micro Refill, E-Z Runner Micro Refillable Dispenser, E-Z Runner Ultra Refill, E-Z Runner Ultra Refillable, Extreme Double-Sided Tape 1/4", Gift Box, IMAGINE Crafts/Tsukineko, Judy Hayes, Ranger Ink, Spellbinders Paper Arts, Taylored Expressions, Thin 3D Foam Squares White, Treat Container, Valentine's Day. Bookmark the permalink.